It’s exactly this tension between retaining your individuality and absorbing yourself into someone else that unfurls throughout Vanishing Twins . . . Her writing is crisp and intelligent, she relies on architecture, Greek mythology and even language to place her relationship in the context of a wider world . 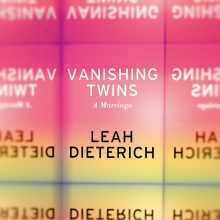 . . Dieterich maintains her searching, inquisitive voice throughout Vanishing Twins. She writes about her own reckoning with her sexuality and exploration of queer identity without becoming pat or coy, giving readers intimate access to her fears and conflicting emotions. Vanishing Twins is a PNBA Finalist!